...7-mile run from Freshwater Bay, over Tennyson Down to The Needles, and back again. 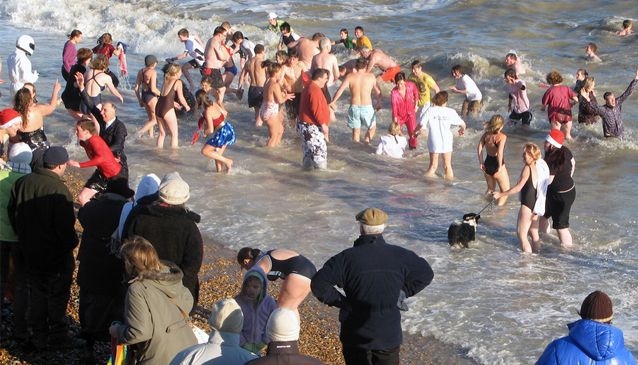 Here on the Isle of Wight we have a rather unusual Boxing Day tradition - the Ventor Boxing Day Swim! While most people spend December 26 either warm and cosy at home enjoying the Christmas turkey leftovers, or off to find a bargain in the sales, a funny thing happens to some islanders… and even a few visitors. Every year, around 50 people decide to strip off (or wear fancy dress) and charge into the cold sea with screams and giggles, while a large crowd of onlookers laugh and cheer in delight. This may be an unusual phenomenon to most of you, but in the beautiful sea-side town of Ventnor, it really is quite normal and has been happening for around 30 years now. Boxing Day 2011 had a great turn out, with over 100 swimmers taking part and more than 1,000 cheering them on, as you can see in this video, which showcases one of the best - and coldest - annual events on the Isle of Wight. The Boxing Day Swim is superb fun for participants and spectators alike, but is also for a good cause. This year, the event was in aid of P.A.T.C.H (Peoples Approach to Cancer Help), which is a charity that helps people travel to the mainland for treatment. Finally, if you want to know more, Stratcat Productions Ltd provided a more detailed video for the 2010 Ventnor Boxing Day Swim. Please do bear in mind that the snow had only melted a few days earlier and it really was extremely cold that year! The Boxing Day Swim is not the only charity event taking place during Boxing Day on the Isle of Wight these days. The Boxing Day Fun Run and Swim at Freshwater may be less well-known, but it’s certainly more of a challenge. It comprises a 7-mile run from the Freshwater Bay car park, over Tennyson Down to The Needles, and then back again. As if this isn’t enough, most runners finish off with a ‘refreshing’ swim at Freshwater Bay. This event, which is also in aid of raising money for good causes, has been running for 21 years, and was started by the West Wight Road Runners. So, for some guaranteed festive fun, join us on the Isle of Wight for Boxing Day 2012!